There is a scene in the new comedy, "While We're Young," in which no one can remember the word "marzipan." One character pulls out his phone to search for it, but the others stop him. "Let's just not know," they say. We live in a world where the notion of ambiguity has become a punchline. Turning to our smartphones when we need something—a forgotten word, a better price, a movie time—has become a reflex. We want things right, and we want things right away. As a result, the consumer journey looks markedly different than it did only five years ago. Instead of a few moments of truth, it's a series of "micro-moments" when we turn to mobile to act on a need. Finding a product or service nearby used to require a combination of the Yellow Pages, a paper map, and a telephone—not the most convenient solution. Thanks to the powerful devices in our pockets, we can quickly and easily find things around us. And we are, in massive numbers. "Consumers have never been more informed because that information lies in the phone in their pocket, in their purse, or on their body," says Annie Zipfel, senior vice president of marketing at REI. In these moments, consumers aren't just getting information, they're making decisions and often heading straight to stores. "We love when someone comes into the store holding his or her phone and says 'I want this tent,' 'I want this bike,' or 'Help me find this; I've read about this; I've researched it'," says Zipfel. With a world of information at their fingertips, consumers have heightened expectations for immediacy and relevance. They want what they want when they want it. They're confident they can make well-informed choices whenever needs arise. It's essential that brands be there in these moments that matter—when people are actively looking to learn, discover, find, or buy. "Consumers today, especially with the technology they have available, they expect immediacy," says Serena Potter, group vice president of marketing strategy at Macys.com. "I think search is really one of those tools that allows them to quickly find exactly what they're looking for and better understand where it's available." 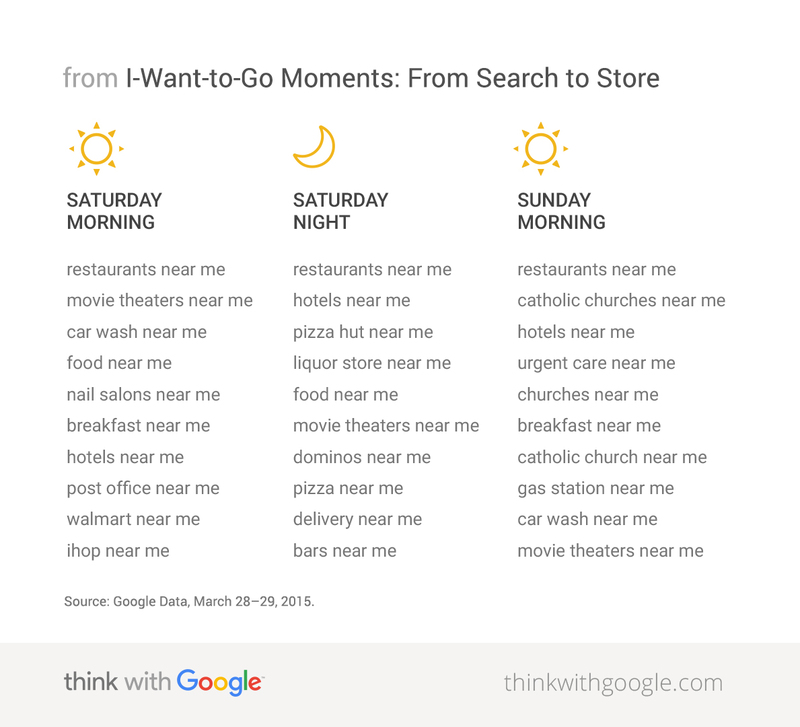 These micro-moments might happen quickly, but brands can still plan for them. Winning in these moments means thinking through situations in which people will look for your store and ensuring you are there. To figure out when these situations are likely to arise, use a combination of hypotheses, observations, and data (free tools such as Google Trends can be a great place to start) to validate your hunches and dig deeper. For example, we suspected that "near me" searches are more common when people travel, which is true; they spike 55% during both Christmas and New Years.2 They're also more common on weekends, when people step outside their usual workday routines.1 And on any given weekend, there are many moments as new contexts spark new needs. Taking a closer look at location-based searches over the course of a recent weekend, we see that on Saturdays, we are more likely to look for movie theaters and nail salons (treat yourself! ).5 Saturday nights are all about finding drinks and late-night pizza. Come Sunday, we are ready for church. Source: Google Data, March 28–29, 2015. You'll notice that while a few brands pop up, many of the top searches for "near me" are generic—"restaurants near me," "breakfast near me," "coffee near me." It seems that convenience often trumps brand loyalty in the moment. So, simply being there isn't enough. Brands also need to provide useful, relevant, frictionless experiences. Brands such as Macy's, REI, and PetSmart are using new ad types and innovations to do just that. For example, local inventory ads show availability nearby—right in the search ad. Zipfel explains, "If a consumer were to type in 'road bike,' it's highly likely that REI will pop up, and they'll see a visual of the product itself, but they will also find out that the exact bike is in stock at a local REI store and how far away that store is." So, rather than buy online and wait for delivery, consumers can get instant gratification. "With Google local inventory ads, we're able to expose local in-store inventory to customers when they're on the go," says Macys.com's Potter. "We know that what's really going to drive them action is to see that there are eight [items] in their size, in the color they want, right now in the store that's five blocks away." The intent-rich moments when people seek location information are incredibly valuable. Based on the insight that 10-18% of clicks on search ads lead to a store visit, PetSmart is investing more in ads that drive customers to retail stores, like location extensions and directions. Businesses are also fine-tuning their location bid adjustments to show search and display ads to people who are within a certain distance from their stores. Today's consumers are increasingly looking for things that are specific to where they are. While the most popular "near me" searches are for things you might expect—gyms, tailors, jewelers, shoe stores, furniture stores, appliances—there are some searches or services you may not expect. People have started to search for "dermatologists near me," "plumbers near me," "jobs near me" and other things that are typically in a high consideration set.1 Today, this in-depth research doesn't require a desktop; it's happening in stolen moments throughout the day. If you're a marketer, the implication is clear: Whether you're a small business or global brand, you need to deliver on needs in these moments. That means committing to be there comprehensively and consistently; delivering relevant, useful messages; and building frictionless experiences inclusive of apps, site user experience, and beyond. Those who stay centered on the consumer's context and intent in the moment will not only deliver on needs, they'll also seamlessly advance the consumer journey and build brand preference along the way. Think about how customers are interacting with your brand or category when they are near one of your stores. What does having a smartphone allow them to do that they couldn't before? Are you delivering useful local information such as directions, inventory, and pricing when people land on your site or app? Even more importantly, does your site's design make it easy for consumers to find this information quickly? 4 Google Consumer Survey, March 2015 n=545. 5 Google Data, March 28, 2015.